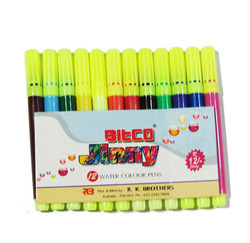 Backed by a team of our creative and skilled designers, we are gainfully engaged in providing an excellent range of Water Color Pen. Renowned for elegant design and high gloss finish, this pen is manufactured at vendors' end from the best quality raw material using hi-tech tools in sync with the set market standards of quality. - Each individual brush is hand crafted by the finest professional brush manufacturers in Japan with their master craftsmanship. - The innovative design of these SAI brush pens helped it win the 2007 ISOT Stationery of the Year award in Japan. - The colors are water-soluble dyestuff ink. Water Color Sketch Pens has a unique trilobe grip that ensures perfect and tireless grasp. 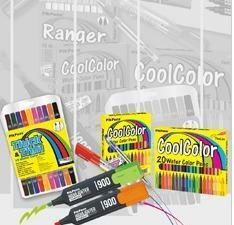 Owing to the wide experience in this domain, we are instrumental in offering Drawing Color Pen to our clients. Kromo Mini is a child favourite! Sketch, draw, colour and you just have to try them to believe how much fun they are!